Description copy can be really tricky. Optimizing it is however a mandatory task if you want to achieve lots of downloads. Every single word of your description must be carefully thought, as this will be your only chance to convince people to download your app. It is however true that people don’t often read (entirely) description and prefer to look at screenshots, but that does not mean that you can allow yourself to write a crappy description. Screenshots combined with a nice description can be a powerful mix. Plus, we will see how descriptions impact on ASO (App Store Optimization) and on SEO (Search Engine Optimization) as well. The first thing to know is that there is a huge difference between Apple App Store and Google Play Store in terms of app description. Indeed, Google Play algorithm takes keywords from the description into account and uses them to rank the app in the Store. It is therefore absolutely necessary to optimize your description with relevant keywords if you want to get the best chances to rank high. However, in the Apple App Store, the description has absolutely no impact in terms of ASO. This means that the algorithm will not take the description into account to rank the app. Instead, Apple provides a keyword field to fill when launching your app (which Google does not). That being said, it does not mean that the description in the App Store is less important. It actually has a major impact on SEO as Google indexes and ranks iTunes pages. It is therefore important to fulfill your app description with relevant keywords that will matter in terms of SEO and therefore will rank your app page higher in Google. Optimize your Google Play app description in terms of ASO as much as possible to increase your chances of a high ranking. Use relevant and impacting keywords based on Google Play Store apps and searches. Optimize your Apple app description in terms of SEO so that your iTunes page will get a confortable position in Google Search. Use the best keywords based on Google searches and web traffic. 2. Tease above the fold! When landing on an app page - whether on an iPhone, iPad or on desktop - people can only see the first 255 characters of the description at first. Indeed, after these lines, it is required to click on “More” to see the rest of the description at the fold. Although Google Play’s description preview is much longer (see picture below), it is still important to put the best content at the beginning of the app description. Indeed, it has been proven that readers tend to read only few lines before loosing their attention. Obviously these lines are most often the first ones. You therefore need to maximize your selling potential by bringing forward your best assets and features. If you only had few lines to sell your app, what would they be? Think like a marketer and seduce your potential clients. Don’t forget that people most likely base their decisions on emotions rather than on logic. Use your value proposition. What makes you unique? Tease them, amuse them, amaze them, make them want to know more and actually _click _on “More”! Make them want to download your app at that very moment! I know, it’s easier said than done, but you can do it. If you don’t feel confortable enough with copywriting, just hire someone to do it for you. But I’m sure that everyone who is passionate and involved can come up with great content! 3. … Don’t forget the rest! Now that you (hopefully) wrote your intro… it’s time to write the unfolded part of your description. There is no magic recipe though. But there are few things that can be done to maximize your chances of success. What you basically want to do it to describe your app as much as you can. Use the 4,000 characters allowed, go ahead! Obviously, you need to insist on the best features at first, always keep in mind that users rarely make it until the end of your description. We saw that descriptions have an impact on Google Play algorithm. So as we said, you need to scatter powerful keywords here and there among your content. Be careful not to overload your text with too many keywords though, or your content will make no sense. You have more freedom for Apple App Store, as description does not impact directly on ASO. You can therefore write a text that is more focused on marketing and user-centric. Keywords still matter for SEO as we’ve seen, so don’t hesitate to use some. A good description is a description which tells users what they are going to experience with your app. It’s important to be straight to the point and honest. Lying and over promising are useless strategies. It would frustrate users who will undoubtedly delete your app. They would even probably write negative reviews, which you definitely want to avoid. By now, you should hopefully have some ideas on what to write in your description. The next question is how to present this content? It’s important to find the best mix between content and form. Use line breaks; aerate your description with spaces between paragraphs. Use short sentences (+/- 120 characters per line). Use small paragraphs (+/- 3-4 lines per paragraph). Use bullet points or lists. Use some (few) words in ALL-CAPS where necessary. The point here is to emphasize on important words or sentences. You want to grab people’s attention on your text and even more on specific parts. Remember that it is extremely important to be the clearest possible: be neat, easy-to-read and appealing. 5. Things that always look good in a description! Finally, there are still few things that are always interesting to add in your description. If you have a significant number of downloads or users, don’t hesitate to insert it in your content. Same for your app’s ranking in the charts. This will encourage people to join in and therefore download your app. It’s also always good to show that your app pleases other users, especially influential ones. You can therefore include positive quotes or great press releases about your app. The point is to reassure your audience. It’s also a good way to prove your authenticity. Never hesitate to brag about your success! If you’ve created other popular and successful apps, why not insert a mention about that in your description? Did you win an award? Tell the world about it! Again, this will comfort people in their decision and encourage them to download your app. 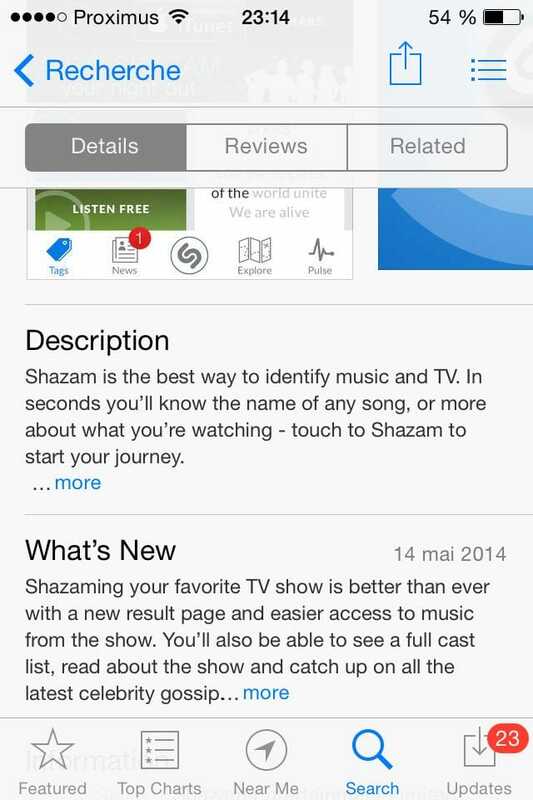 Few months ago we would have advise you to update your description as soon as you updated your app. However, both Google Play and Apple App Store have created a new section called “What’s New”. They now allow developers to announce various updates or bugs fixing in a specific field dedicated to these matters. Obviously, use that space and inform users of any changes made to your app. It’s your turn now… you’re more than ready to write an awesome description! Did you find this article useful? Do you have other interesting tips? We’d love to hear more about you, readers… Share your impressions and experience in the comments section below!